Illegal employer practices often result in harassment, trauma and real suffering for employees. Consumer Action Law Group helps employees combat illegal practices of employers and sue on behalf of employees. Many US employees are victims of illegal employer practices without realizing it. If a particular practice by an employer causes harm to the employee, the employee has the right to pursue legal action against the employer. Consumer Action Law Group is a law firm with employment lawyers that help employees identify illegal practices of employers. The firm helps employees pursue legal action against employers who mistreat employees. 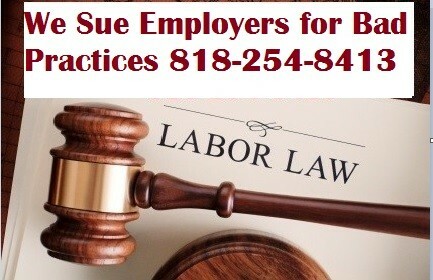 Employment lawyers advise employees on workplace lawsuits based on the State and Federal laws that apply. Consumer Action Law Group also seeks to protect employees against safety breaches at work. “It is the duty of an employer to supply, maintain and (if needed) reconstruct a workplace that is safe for work,” said Attorney Yelena Gurevich from Consumer Action Law Group. Employees have the right to appoint a lawyer for labor laws if the employer does not ensure proper protection from physical agents, noise and vibration. The company also helps employees whose welfare and physical safety has been harmed owing to the misconduct of employers. “It is the duty of employers to maintain a conductive work atmosphere for employees at work. Employers are also responsible to train employee on how to use proper health and safety equipment if there are potential health hazard in the workplace,” said attorney Gurevich. Consumer Action Law Group also stresses the need for companies to appoint a competent Safety Officer of the organization. Consult with our Employment Lawyers for FREE. We sue employers for illegal practices!